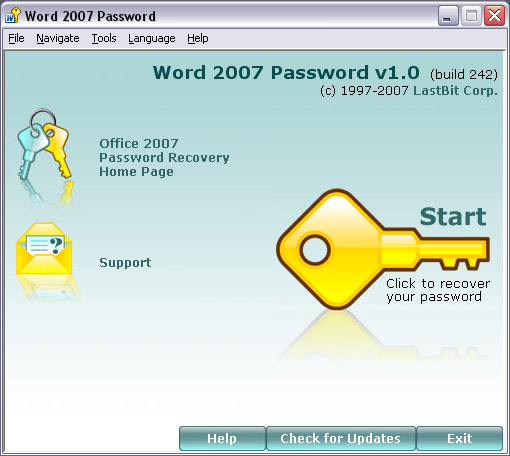 Word 2007 Password 1.0.242 Free Download - Password recovery tool to retrieve Word 2007 passwords to open. Password recovery tool to decrypt Word 2007 passwords to open. Passwords to open are extremely hard to break in Word 2007. To recover the password, a brute-force attack and a dictionary search must be used. You can use Word 2007 Password program for free to recover the password. If the password cannot be found, you pay nothing. If the password is found, the program informs you and prompts you to pay the Service Fee. Statement: First, please download the orginal installation package by clicking the download link. Of course you may also download it from the publisher's website. Using Word 2007 Password crack, key, patch, serial number, registration code, keygen is illegal. The download file hosted at publisher website. We do not provide any download link points to Rapidshare, Hotfile, Depositfiles, Mediafire, Filefactory, etc. or obtained from file sharing programs such as Limewire, Kazaa, Imesh, Ares, BearShare, BitTorrent, WinMX etc. Software piracy is theft. If you like Word 2007 Password please buy it.